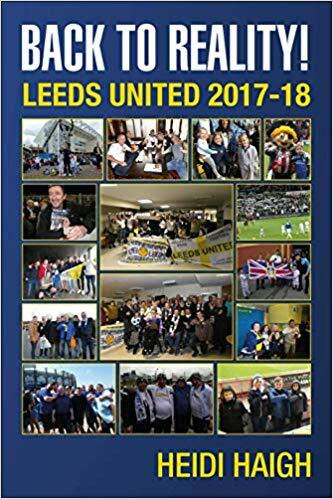 I can’t believe how quick my new book “The Sleeping Giant Awakens, Leeds United 2016-17 has appeared on Amazon and will be in the Leeds shop at the end of the month! Great stuff! As usual I will be getting a quota to sell and will autograph copies for those who want them through me. I always carry one copy of each of my books on me so if anyone wants to meet up please let me know. As I was getting cash out of the machine last night I heard a voice behind me saying someone is trying to attract your attention. There was no way I was taking my eyes off my card and money as I feared a scam so stuffed my money in my bag quickly. As I turned round to leave this voice behind me said again that someone in the car next to me was trying to catch my attention. I did turn around this time and there was a young lad shouting Leeds, Leeds, Leeds to me, then his dad appeared out of the shop shouting Leeds to me too oops. Sorry lads!! As usual though, Leeds fans are everywhere. We weren’t leaving Leeds until 8.00 am so it was a normal get up call at 6.30 am before getting to Leeds for the coach. The weather was fine but we would be heading into storm Brian in Bristol but I wasn’t looking forward to the damp cold. I’d forgotten Sue wouldn’t be travelling with me today so had a seat to myself. Before I left home I’d tweeted and put on Facebook, come on Leeds, 3 points today. I also tweeted Leeds saying they could do it and to believe. With so many fans writing us off already with a defeat I had my bolshie head on, and that no we wouldn’t get beaten; we would have our backs to the wall, we would battle and to believe. As Elvis Presley came on the radio singing I just can’t help believing, I wondered if that was a good omen for today and would know by 5.00 pm. We stopped off in Gloucester and I was one of the first off the coach into the pub. What I would say is don’t ever ask me to get any drinks in, because half of the coach got served before me as somehow I always end up invisible at the bar! Apparently they were 6 staff down who’d phoned in ill before their reinforcements arrived. The girl who eventually served me had noticed the ones who I knew needed to be served in front of me which was right, but I still don’t know how everyone else off our coach got in front of me though. Instead of queuing again I used the Wetherspoon app and couldn’t believe it when they apologised for the delay! I got my food within 10 minutes so no delay from what I saw and told them so. A group of us had a good chat in the pub about the team and what we reckoned would happen today and I also had a catch up with Mick Hewitt. We have 18th November penciled in for our song recording to take place and I’m looking forward to this immensely. The practice went really well and it will be good to finalise our ambitions of getting the cd/dvd done in time. I was on a Facebook thread the other week on one of the Leeds groups but for the life of me cannot remember which group. The thread was about our old sings and I was going to get in touch with a couple on there to see if there were any songs I’d forgotten to include. If anyone can remember being part of this please let me know as I’d be happy to speak further on this. We arrived at the ground 20 minutes before kickoff and ended up getting off the coach a few at a time as we were stuck in traffic. As I got through the security lines I was looking for entrance 38 so ended up at the far end of the terrace. After asking our steward where the entrance was it turned out that it was the area inside the ground not the turnstile entrance number doh… As I queued up then it was getting closer and closer to kick off and I suddenly saw some of our fans going mad who’d already got into the ground. It turned out that the turnstile was broken and in the end fans were climbing over it. I wasn’t looking forward to climbing over it but luckily the one at the other side was letting fans through so I went through that one. If I’d have gone in the first turnstile I’d come to when arriving at the ground I’d have been at the right place instead I had to walk right back to the other end. When I got in the stand I saw that all the Leeds flags had been placed at the front instead of the back so put mine up and decided to stay there just to the right of the goal as there were spaces there. giving Bristol their highest attendance of the season. Dallas had pulled out of the squad after his mother died and condolences are sent to Stuart Dallas and his family on their sad occasion. The swirling wind and fine rain started more or less as soon as we kicked off so it was going to be a battle against the weather too, but I thought that would work in our favour as it would be a backs to the wall game. Within five minutes Leeds were in the lead with a long range shot from Saiz that flew into the net with a deflection at the far side of the ground. The celebrating Leeds fans were in good voice and the early goal did everyone the world of good. It wasn’t much later before Saiz scored a second sending everyone wild. Leeds, Leeds are falling apart again had the Leeds fans showing their gallows humour once more. Bristol never gave up and were seeing plenty of the ball though and were a threat, but the difference being Leeds dealt with it. Having Vieira back in midfield alongside Phillips and O’Kane was what I thought we needed to shore it up and it certainly worked. Their first shot on goal was fumbled by Lonergan but he stood tall after that. I felt quite calm for the majority of the game but as it got near half time, I just wanted to ensure Bristol didn’t score as I felt it was vital they didn’t get back into the game. Fantastic support from the Leeds fans although when we scored the dreaded smoke bombs appeared on the pitch, a blue and a yellow one. After the second goal one got thrown which ended up underneath my flag and I was glad when their steward got it away from there. The second half saw Leeds come out and attack our end. The Leeds fans sang for the whole game and despite the blustery conditions, the team continued where they left off. They played as a team and were backing each other up even though at times we were chasing shadows as Bristol got past us. They never gave up which is all that is asked of them, to keep fighting gives us a chance. When Phillips took a corner the ball came to Lasogga in the box to head home for our third goal and send us all into raptures once again. There were absolute fantastic scenes on the terraces from the celebrating Leeds fans, with many who probably couldn’t believe the score. I was just thinking I knew we could do it!! I just wanted us to see the game out without giving them a goal. Around the 80 minute mark there was an altercation in the middle of the park nearer to the bench than us. I missed what happened and even after seeing videos of it afterwards, saw their player square up to Berardi who stood his ground. Some said Berardi had nutted him, others said there was no contact and I couldn’t make my mind up about what happened as he was sent off. I thought their player was play acting and the next thing he got sent off too once he’d been treated for his “injury”! There was lots of jostling by the tunnel and then I thought something had kicked off in there as someone went running down it. I felt better knowing they’d lost a man too as despite us having a three goal lead I didn’t want Bristol to score. As I was getting my flag untied a Bristol Steward who had been having a good look at it earlier, helped me untie it and a big thank you to him for the assistance. As it was, we saw the game out to get the win and the three points. Look what happens when they believe in themselves and the fans get behind them! Lots of happy fans were singing the Vieira song as we went out of the ground. I saw these young lads without shirts on as the police headed towards them although I’d not seen anything untoward happen. At least they carried on up the road with the rest of us. I was surprised there wasn’t a welcoming committee of Bristol fans as in the past, there again the ground had emptied very quickly! It was raining very finely on the way back to the coach and it was sad seeing our exhausted disabled fans making their way back. With the weather being so bad, waiting at the end of the road wasn’t a good idea. We were soaked by the time we got back to the coach and I was glad I’d brought some hot water with me for a drink. I took my wet jacket off and had left my big jacket on the coach so was able to keep warm for most of the journey. By the time we reached Tamworth services along with the Harrogate and Keighley whites, I was glad to get a costa to warm me up. The bad weather started to kick in as we reached Sheffield and despite the weight of the coach it felt a little too precarious for me going over the viaduct. I was glad to get over it quickly and in one piece. Apart from having to negotiate a flood near hell fire cross roads I got home safely and was back in good time. My daughter Dani then showed me the videos of the team having to make two attempts to land at Leeds Bradford airport after flying to this game. I’m glad they arrived safely and it was funny watching them, but I’d blame whoever decided they would fly to this game! There again it is probably because of the Josh Warrington fight tonight and maybe there are more than just Berardi heading to watch him. Good luck Josh. We have a busy week with the visit to Leicester in the next round of the Carabao Cup and the Sheffield United home game next Friday. As I’ve said before Leeds, just play to our strengths and enjoy ourselves and let the other teams worry about us. Hitting them before they have woken up was brilliant!! See you then – LUFC – Marching on together!